Shin Mya Wa was a courtier. His father was Maha Nan Da Thin Kyan, the governor of Sinetin. His mother was Zay Ya Khay Ma, the daughter of Sin Kay Aung Tin and Saw Than Da. He was born at 4 AM on Thursday in the fullmoon day of waso in 1542 AD. King Min Bar was also born to Saw Nan Di, the elder sister of Zay Ya Khay Ma and king Min Ra Zar on Saturday in the month of waso in 1542 AD. Therefore, Shin Mya Wa and king Min Bar were cousins. Maha Pin Nya Kyaw was born in 1539 AD. Shin Mya Wa, king Min Bar and Maha Pin Nya Kyaw were friends. Those three friends. Those three friends were educated in the monastery of monk Agga Sein Day Ya until the age of 16. And then, those three friends went to India to study further education. King Min Bar and Maha Pin Nya Kyaw returned to Rakhine after they had completed in education. But, Shin May Wa changed into an ascentic and studied under the ascentic Thi Ri Vi Tha Noe for 23 years. After he had completed in education, he came back to Rakhine and he lived in Taungnyotaung monastery where he had ever studied. He wrote the book of element called Namanta. One day, Shin Mya Wa entered the palace with a stick in his hand while the assembly was being held. King Min Bar paid respect to him and let him climb the throne. And then, Shin Mya Wa said to the king aiming at his forehead with the stick. “Hey great king, are you a male or a female?” “I see you female.” After that, he climbed down from the throne saying “female, female, female” and went back to his way. After the assembly had stopped, Maha Pin Nya Kyaw spoke to the king what Shin Mya Wa meant. Maha Pin Nya Kyaw said to the king, “You look like a wife who serves for husband’s guests because you don’t object that the islamists who arrived in Mraukoo since your father’s regime, are building the mosques. That is why, Shin Mya Wa calls you female.” And then, the king asked Maha Pin Nya Kyaw what he should do. Maha Pin Nya Kyaw told the king humbly to recapture twelve cities of Bengal King Min Saw Mon had to render for king Thu Ra Tan. Finally, the king accepted his advice. The king let him manage for the war by giving him the title of Maha Nan Da Thu Ra. The king could recapture twelve cities of Bengal due to the victory of the war. And then, the meritorious deeds were done in Buddha Gaya. Mahabawdi temple was also restored. The king came back to Mraukoo by taking unaccountable Buddha relics from the ruined pagodas and temples. Chitthaung pagoda was built enshrining those Buddha relics. Shin Mya Wa also managed the magical tabulation protection for the city of Mraukoo. Finally, he gave up his life for the sovereignty of Mraukoo for one thousand years. When he caculated the astrology for the magical protection, he knew that the Thursday-born person must give up his life at the set time. But, he didn’t want to kill other people, and there was no time to look for as well. Therefore, he stabbed his abdomen himself with a knife and wrapped his intestine around the palace pillar and died of running as much as he could. Although he instructed the ministers to bury him in the place of his death, the king didn’t do because he was not willing to bury in the ground like a dog and a pig for a wise person. 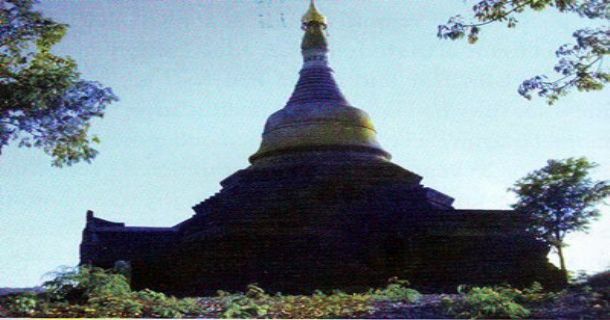 Instead, the king cremated the corpse and made the tomb enshrined with the bone ash on the spur of Parapaung hill in the south of Chitthaung pagoda. Such place is called Shinmyawa cemetery. After the bone cave had been destroyed by desperados, the Buddha image was built over the tomb by repairing it. By walking to the north along the mountain range, it reaches Shinmyawa pagoda. King Min Bar built a pagoda dedicating to Shin Mya Wa by enshrining his leftover valuables and the jewelries donated after he had been dead in AD 1587. The pagoda was called Shinmyawa pagoda in reference to Shin Mya Wa. The mountain in which the pagoda stands, is also called Shinmyawa mountain. The pagoda has four corners at the base and measures 50 feet in length and 40 feet in breadth. There is a cave adjacent to the pagoda in the east in which the Buddha image dwells. The second terrace of the pagoda has the cave openings in the south, the west and the north. The original upper part of the pagoda had already fallen down, therefore, township Samgha Mahanayaka order reconstructed it in 1984 AD. When the debris of the pagoda were cleared, the bronze Buddha images were found in the heap of the stones fallen from the relic chamber. Nowadays, the stone figure of Shin Mya Wa was put in the place of his death to the public know.